These 3-D Chocolate Truffle Pumpkins are too good to share with the trick-or-treaters--you'll want to hoard this candy all to yourself! The glossy pumpkins are completely edible (and delicious! ), and they're filled with a rich, fluffy chocolate truffle mixture. I like to top mine with a few Halloween candies and a pinch of sprinkles! 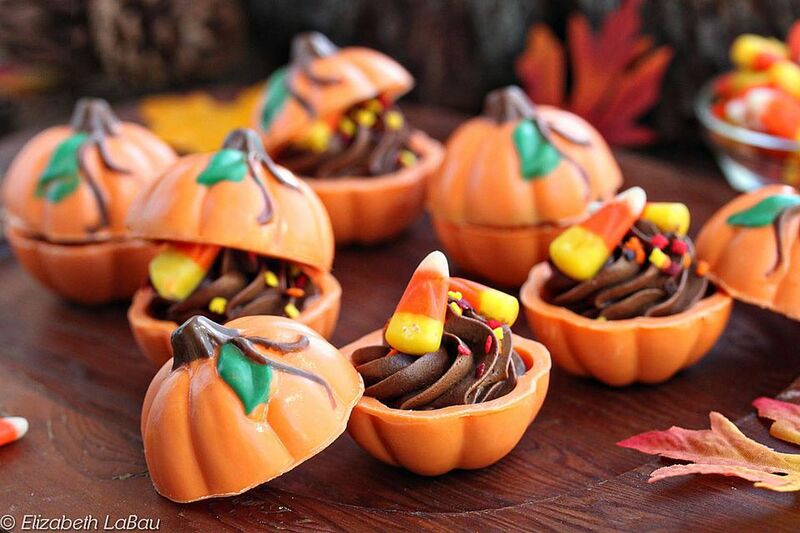 You could also nix the chocolate filling and fill the pumpkins with other candies, ice cream, whipped cream, or even mousse. To make this recipe, you will need a special 3-D pumpkin candy mold (I used this Wilton one). It comes in two pieces, and it produces perfectly sculpted 3-D pumpkins. It can be purchased from the Wilton website, or is often found in craft stores like Michael's or Joann's. If you can't find the mold, one alternative would be to make chocolate bowls out of orange candy coating. They won't look quite the same, but they'll still have an amazing 3-D pumpkin effect! First, make the chocolate ganache for the truffle filling. Place the chopped semi-sweet chocolate in a small bowl, and pour the cream into a small saucepan. Heat the cream over medium heat until it comes to a simmer, but don't allow it to reach a full boil. Pour the hot cream over the chopped chocolate and let it sit and soften the chocolate for one minute. After a minute, gently whisk the cream and chocolate together until it is smooth, shiny, and satiny. This is your ganache. Press a layer of cling wrap directly on top of the chocolate and refrigerate it for an hour, until it has the thickened texture of peanut butter. Don't let it chill too long and become rock-hard. While you wait for the ganache to chill, prepare the chocolate pumpkins. Melt the green and brown candy coating in separate small bowls in the microwave, heating each for short 20-30 second periods, stirring after every 30 seconds, until they're melted and fluid. Use a small food-safe paint brush to paint the candy coating on the inside of the base sheet of the pumpkin mold, following the design of the molds and adding green leaves and brown stems and tendrils. Refrigerate the mold briefly to set the green and brown candy. Melt the orange candy coating in a medium bowl, microwaving it in 30-second increments and stirring after every 30 seconds to prevent overheating. Once melted and smooth, spoon 1 1/2- 2 tablespoons of coating into each mold, so that it fills the molds about halfway. Tap the mold lightly on the countertop to remove any air bubbles, then carefully press the top sheet of the pumpkin mold on top. As you press down, the orange coating will be forced up the sides of the base mold. Click the tabs together, then turn the mold upside-down. Refrigerate the mold for 10 minutes, then place it in the freezer for 2 minutes before unmolding. To unmold, snap the two pieces apart and gently flex the mold to release the pumpkins. Trim the edges, if necessary, to make the smooth. Repeat the process so that you have 12 pumpkin halves, or enough for 6 full pumpkins. Once the ganache is chilled and has the texture of peanut butter, transfer it to a mixing bowl and fit the mix with a whisk attachment. Whisk it at medium-high speed until the ganache transforms from a silky, shiny mixture to a fluffy, light brown frosting. Transfer it to a piping bag fitted with a star tip. Pipe a big swirl of whipped ganache into the 6 chocolate pumpkin bases. Top them with several candy corns or other Halloween candy, and a pinch of Halloween sprinkles. Serve them with their tops askew for an elegant appearance, or place the tops on and let the chocolate filling be a surprise! The ganache has the best texture the day it is made, but the pumpkins can be refrigerated for several days if necessary.